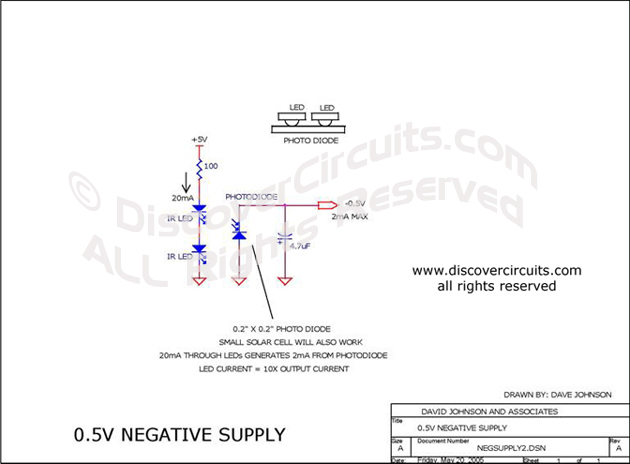 Circuit: 0.5V Negative Supply__ Circuit designed by David A. Johnson, P.E. Although not very efficient, this simple circuit, consisting of two LEDs and a photo diode, generates a negative voltage with a current level of a couple milliamps. It is ideal for supplying a negative rail to low power “rail to rail” op Amp circuits, which need to have a true zero volts output.